The Supreme Acklam Piestie (complete with carrots naturally). The Supreme Acklam Piestie (complete with carrots naturally) is a development of (some would say an improvement upon) the traditional Cornish Pasty. It was invented when we found difficulty in standardising the shape and size of home made pasties. We hit on the idea of overcoming the difficulties by using the same filling in a pie made in a standard 11cm foil pie dish. We start with 1lb (454 grams) of minced steak together with carrots and onions (4 and 3 in this mix but it depends on size - just what looks right) and cook it in the microwave at 600W for 20 minutes. Stir and then cook for another 20 minutes. Add three Oxo cubes, stir and cook for a final 20 minutes. Whilst the mince, carrot and onion mixture is cooking, peal and dice one swede (rutabaga) plus as many potatoes as needed to produce the same volume as of swede (or a little less, not really important) then boil them (in the same or different pans depending on what you have to fit them, it doesn't matter) until they start to soften. 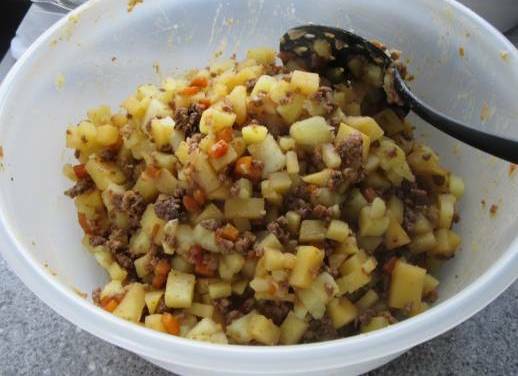 Once the swede and potato is cooked, drain and mix in with the mince, carrot and onion. The mixture is deliberately more vegetable than meat, as that is how we like them, but can of course be adjusted to taste. The photo shows the cooked ingredients mixed and ready for use. 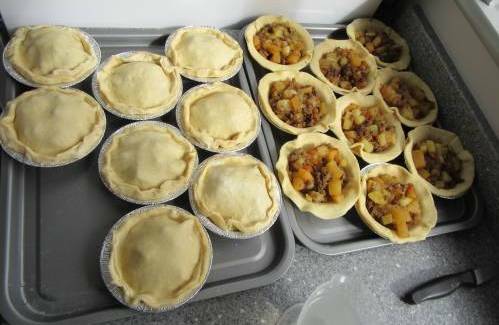 The ingredients with the quantities given is sufficient for between 18 and 24 piesties, depending to an extent on the size of the swede (and, consequently amount of potato) used. We wanted to make 18 because we happen to have two trays which will comfortably hold 9 of the foil dishes each. The pastry is standard shortcrust. A base of 600 grams (21 ounces or so) of flour will make enough pastry for 18 piesties with a little left over. Any left over filling can be frozen for use at a later date or, as we often do, be baked in a larger pie dish with just a top crust made from the excess pastry. We use two circular pastry cutters to cut out the bottoms and tops of each piestie. 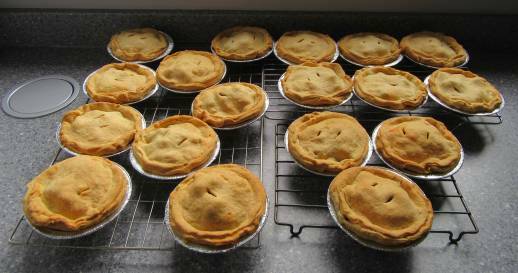 The edges are crimped by hand, giving each Supreme Acklam Piestie (complete with carrots naturally) its own unique look. A couple of slits in the top of each and they are ready to go into the oven. Using a fan oven and baking at 185 deg C (365 deg F) it took about 35 minutes to cook the piesties. Adjust the temperature and time depending on how your oven operates. 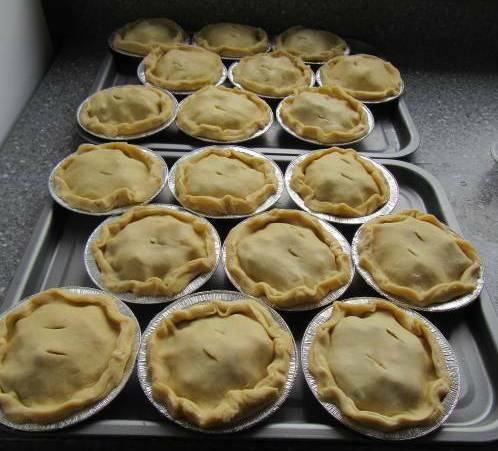 We checked after about 25 minutes as this was the first batch of Supreme Acklam Piesties (complete with carrots naturally) that we had made in our new oven - but it is a good idea to check after about that time anyway, just to see how they are doing. We make sure the pastry is cooked but deliberately don't over-bake them as we freeze them (wrapped in greaseproof paper) and they usually receive a second, short, baking (after being thawed) when we eat them.